Very accessible, and often photographed, I turned up early at Chesterton Windmill because the weather forecast looked promising, with a few clouds likely. I wasn’t the only one – it turned into an ad-hoc photographers get-together, swapping stories and locations while we took photographs of the windmill. 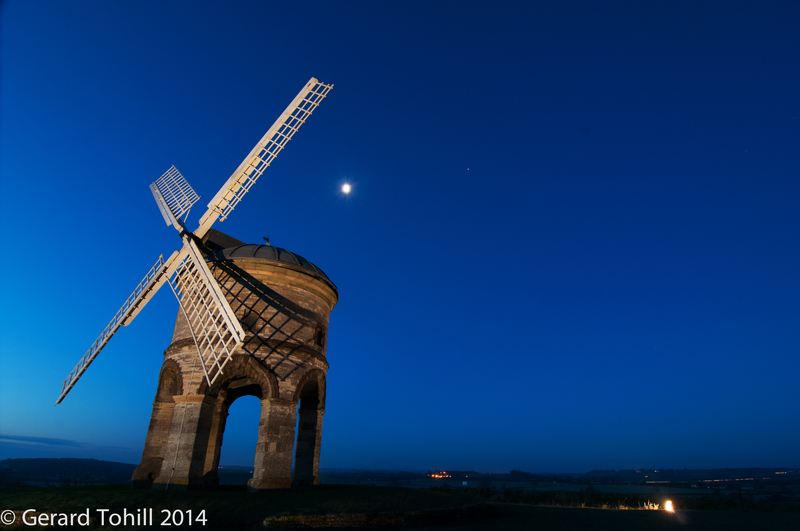 The promised cloud did not materialise, although I found out that the windmill is lit up at night – noted for future reference. Bizarrely, whilst it started off cold, even though it was just before dawn, it wasn’t freezing. However it got colder later on, just as the sun rose above the horizon. This had the strange effect of allowing moisture to form on my filters, which then turned to frost – I ended up having to defrost them (very gently) with a microfibre cloth. Weather eh? Photography stuff: 12-24mm lens at 12mm, 10 seconds at f/9.0, tripod. Nice image. Was this from artificial lighting of just enough artificial light to get the shadows. I suspect that it was natural light with your settings. I’ve not experienced the fogging/freezing issue. Definitely problematic. I wonder what your image would have looked like with the frosting on the filter. I’ve read that Pictorialists would use soft lenses and/or smear oils on their lenses to create a more painterly or softer image. To think we do that in postproduction. Thank you. There were four floodlights sited around the windmill, and they gave the shadows of the sails that you see. As for the fogging – the temperature dropped quite quickly, just enough to freeze the condensation on my filters (up until that point I had been able to wipe them clean with a cloth). I did take a couple of images with the frost on – and, like you say, they give a softer feel. Trouble is, the effect was not consistent across the image, so not to my liking. Understood. Thanks for the detailed explanation.